The 20ft open top shipping container is a unique shipping container with the top part removed and replaced with a tarpaulin and special cross beams for stability. The containers are useful in transporting tall cargo but other uses have been coming up due to the special characteristics of such containers. Transportation of tall cargo. Some cargo types have dimensions that cannot fit through the standard or side-opening doors of standard shipping containers. The 20ft open top shipping container comes in handy as cargo is loaded from the top using cranes and covered using tarpaulins. Transportation of all animals. Some animals such as giraffes and elephants that either cannot be transported using aircraft or cannot survive air transport rely on the 20ft open top shipping container. 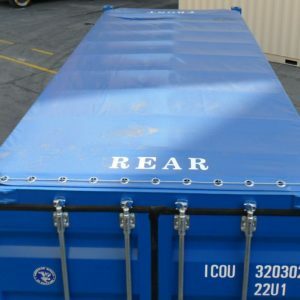 Although the container has to be specially prepared with ventilation and special covering on their base, these containers offer safe reliable transportation solutions for such unique cargo. Garbage disposal. Large neighborhoods that are far from garbage dump sites depend on the 20ft open top shipping container as a garbage dumpster. Although the containers are fitted with unique handling grapples at the edges to enable the garbage disposal trucks to on-load and offload them easily, their large capacity saves transportation costs through fewer trips. 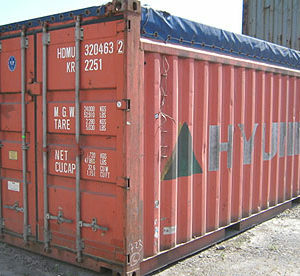 The 20ft open top shipping containers comes in two main types. The first type is a hard top variety of shipping containers that have a steel lid, or top, that can be added and removed with a fork lift or crane. These types of containers are typically used to haul heavy equipment or cargo, or other dry goods. 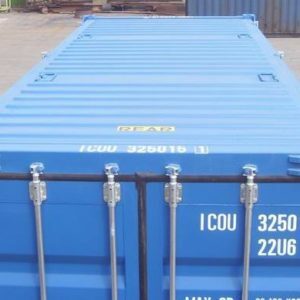 The second type of open top shipping container have a soft top such as a tarp roof that is lashed into place by heavy eyelets/lashing rings, and supported laterally by roof bows. Once in place, the roof bows not only support the tarp, but also provide some structural value as well. Companies that deal with the transportation of tall cargo such as oil derrick parts and wind turbine components use the 20ft open top shipping container due to its ability to accommodate the cargo’s unique dimensions while in transit. Animals that cannot be transported using aircraft are often transported using soft-top varieties of these containers equipped with ventilation and special flooring. Garbage disposal companies like the 20ft open top shipping container due to its large dimensions and unique tyne latches. These characteristics make collecting and disposal of large amounts of garbage and waste easier and more cost-friendly.